Unique Landscaping has 20 years of experience helping people expand their living space with decks, patios, and pergolas. If you need a Tulsa deck builder with the drive to create exactly what you want then give us a call today! If you ‘ve been looking for Tulsa deck builders that have the experience and skill to turn the dreams in your head into a reality then you’re in the right place. Our Tulsa deck builders will work with you to design the perfect deck for your ideal outdoor living space that works seamlessly with your budget and vision. 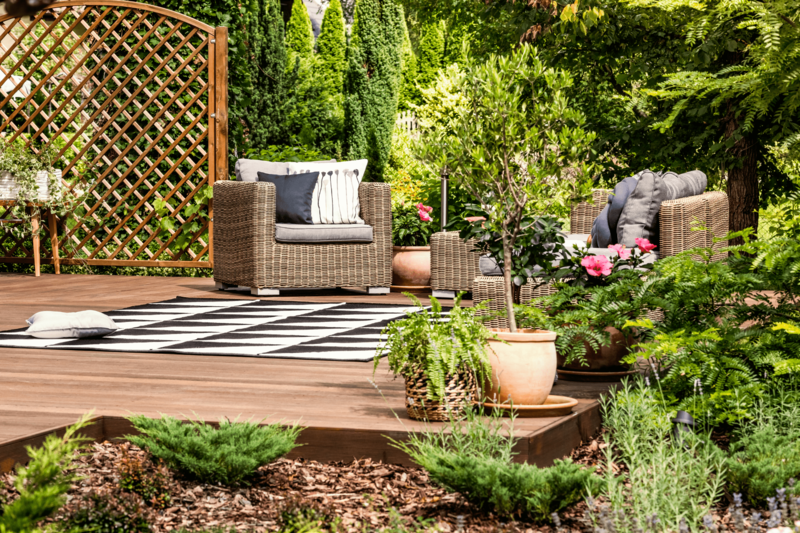 We want to provide you with the pleasure of expanding your outdoor living space in a way that only a custom backyard deck can offer, and when you choose Unique Landscaping in Tulsa you can count on excellence and integrity with professional and qualified contractors you can trust. We not only want your business, but we want your friend’s and neighbor’s business too. We make sure to treat you in a way that you’ll want to recommend us to everyone you care about. When you give us a call we will send someone to inspect the property and go over the details as we discuss your vision. Once a plan is drawn up, materials are chosen, and budget solidified we will begin construction. Our Tulsa deck builders will work quickly and efficiently to get the job done fast with minimal intrusion into your day. We are bonded and insured and always follow all safety requirements and city codes so you can rest easy knowing we are increasing the value of your property and not cutting corners or taking shortcuts. building a luxurious deck out of exotic woods. We can create a custom deck out of gorgeous tropical hardwoods that are known to last for abnormally long periods of time. building an elegant pergola, arbor, patio, or deck that is perfect for hosting your family or friends for outdoor get-togethers, or even just for yourself to enjoy an outdoor oasis in your own backyard. installing a pressure treated deck that can effectively withstand the wear of the outdoors, ward off bugs, microorganisms, and fungal decay. you may also be interested in our outdoor fire pits, kitchens, or fireplaces to help finish off your perfect luxurious outdoor oasis. Whatever you need, here at Unique Landscaping in Tulsa our landscape architects can take your project all the way from initial idea to finished product that you can’t wait to show off to your friends. If you live in Tulsa, Broken Arrow, Jenks, Owasso, Sand Springs, Sapulpa, Coweta, Bixby, Claremore or even all the way to Norman and Oklahoma City we are ready to provide you with friendly Tulsa deck builders with expert know-how to create an idealistic outdoor getaway in your backyard. Give us a call today for a free estimate! We look forward to working with you!